At the top of the world. Roland, Aline and Sheila touring Berry Ranch near Raton in May. 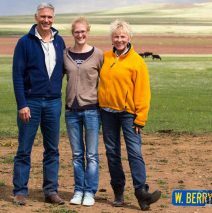 ◆ We recently had the pleasure and rare privilege of touring the ranch of one of our suppliers, Berry Beef Ranch. Landon Berry (6thgeneration Berry family rancher), his father, Patrick and their friend and business partner, Matt Oakeley, hosted us at the breath-takingly beautiful and vast high mountain ranch. The grasses there are some of the best anywhere – even with the sparse snow this year. The timing was perfect to include our niece visiting from Germany. She was able to experience a slice of authentic New Mexico life and history – more than the average tourist gets to see. Additionally, of course, it confirmed our confidence in this new source of impeccably raised, grass-fed-and-finished beef that we offer to you at Joe’s. More at joesdining.com. Click on partners. –Monday May 21st5pm – 7pmCoffee with the Mayor.Meet Mayor Alan Weber here at Joe’s. Your chance to see him, hear him and talk with him in a relaxed and casual event. Then stay for dinner! – Tues May 22ndall day long, gives us the opportunity to support the efforts of one of New Mexico’s most dedicated animal rescuers, Natalie Owings. Natalie and her wonderful volunteers will be here at Joe’s all day Tuesday advocating for Heart and Soul Animal Sanctuary, a no-kill shelter that takes in quite a variety of animals in need – dogs, cats, horses, chickens and more! Joe’s will donate a portion of every dollar you spend that day to this great work. So eat a lot, spend a lot and know it will benefit critters in dire need. – May 28thMemorial Day– the unofficial start of summer heralds in our giant Kobe-style hot dog. Mmmm . . . delish! Sheila looks forward to it almost as much as she does Joe’s famous Margherita Pizza. Hold yer horses on that one – no Margherita until the local heirloom tomatoes have ripened. ◆Watch him work. Richard Eeds broadcasts the Richard Eeds Show live from Joe’s each 1stFriday of the month from 1-5pm on Hutton 1260 AM KTRC. Richard keeps us abreast of all the New Mexico news. ◆Constant exposure to toxins is making us sick in ways we don’t yet fully understand. The collective state of our health in the last 20 years is deplorable. Decades ago, we hardly heard the C-word (cancer). Diabetes was rare. MS, Parkinson’s Alzheimer’s, asthma, ADHD, kidney disease, IBS, obesity, autism, allergies, celiac – these all are common now, even in youth. What the heck has precipitated this state of unhealth? I believe there are several factors and changes in our contemporary world that mitigate against our health, not least of which is the chemicals used so liberally on our food supply. My favorite bully to bully is of course Monsanto (now owned by Bayer Chemicals). It’s a perfect time of year to bring up the subject of Round-Up, AKA glyphosate. Watch carefully for that word on your garden chemical labels, GLYPHOSATE- another word for RoundUp. Avoid it like the plague it is. I do not exaggerate. 80% of our food supply is contaminated with glyphosate. Our wheat is drenched with glyphosate just before cutting! Why? First of course, it efficiently kills all the weeds just before harvest. As well it adds weight ($) to the wheat kernels. But worst of all the poisonous residue stays through milling, processing and the end product. A chilling thought – all those breads, cookies, pasta, pastries laced with glyphosate! Soy, corn, vegetables and fruits are doused as well. Monsanto’s glyphosate toxicity can be found virtually everywhere, in blood and urine samples, breast milk, drinking water and more. So what’s wrong with glyphosate in our food? And can we avoid it? “What we have with glyphosate is the most abused chemical we have ever had in the history of man,” said Dr. Don Huber, an expert in chemical toxicity. His findings and those of many other scientists state that glyphosate causes mutations in human DNA even at a concentration 450 times lower than that in agricultural application. There are many other (horrible) effects like birth defects and fertility problems, extreme disruption of gut flora and digestive pathways (AKA celiac), botulism in cattle. What the hell is wrong with our gate-keepers(FDA, Dept of AG, CDC, AMA)that they allow this kind of atrocity to rain on our food supply!!?? And what can we do? The answer is always the same. Becomeinformed, vote with your dollar, avoid all fast food chains, buy locally grown foods that are organic or better than organic, grow your own. And for you gardeners, here are a few suggestions for weed-killers that are a whole lot safer than Round-Up. Natures Wisdom 20% vinegar, BioSafe Weedkiller, EcoSmart Weedkiller, Avenger orange oil. ◆ DiJa Know? Walking extends life and boosts health. Several studies have confirmed that the simple act of walking boosts health and longevity. In one study, walking for 20 to 25 minutes per day added anywhere from three to seven years to a person’s life span. Research published in 2017 found that as little as two hours of walking per week reduces mortality risk in older adults. Walking lowers your risk of Type 2 diabetes, depression, dementia, hormonal imbalances, arthritis, PMS, thyroid disorders, fatigue, varicose veins and constipation. Holy cow! Could it be easier? ◆ The vital importance of Vitamin B12. Vitamin B12 deficiency is prevalent in vegetarians and the elderly. It’s been linked to the onset of anemia, brain fog, depression and heart disease. It is unfortunate that proposed vegan sources for vitamin B12, like tempeh, spirulina and green leafy vegetables, contain insignificant amounts and do not provide the body with the levels required. B-12 deficiency plays out in the following: jaundice –yellowing of the eyes and skin, which is caused by the high amounts of the bilirubin pigment being released from the destruction of fragile red blood cells brought on by low vitamin B12 levels; memory loss or cognitive difficulties; overwhelming fatigue. Optimal levels of B12 are as important as folic acid during pregnancy. Supplementing B12 may help in lessening the effects of depression. Vitamin B12 is animal-sourced- abundant in red meat, poultry and dairy products. uTuesday night tradition at Joe’s – Spaghetti and Chianti Night. $29.95 for twowill get you Caesar Salad, Spaghetti with homemade Bolognese and a great ½ ltr of Chianti. Wadda deal! The Bolognese sauce is made with our grass-fed-and-finished Berry Ranch beef. the (GMO) seeds to planting, fertilizing, processing and shipping. We as consumers cannot with confidence hand over the entire stewardship of our food to these fewmultinationals. Our passion here at Joe’s is for a local sustainable food supply – food produced by growers who are accountable for what they grow. KYG – Know Your Grower. We are able to look our local farmer in the eye and ask him about his growing practices or even visit his operation. This gives us the confidence that we are eating food that is healthy,wholesome, non-genetically engineered, often better than organic, humanely treated and minimally processed. It is grown with a smaller energy-use footprint and transported short distances. We cannot divorce human health, the economy, ecology, personal (perhaps spiritual) satisfaction or honorable work from food. Food is fundamental. What we eat, where it comes from, the stewardship of food animals, the nurturing and building of soils – all these factors affect us at a cellular and visceral level. Santa Fe is fortunate to have one of the very best Farmers Markets in the nation. Here at Joe’s we offer this bounty to you, keeping dollars in the community. In the interest of transparency, in 2008 Joe’s spent $30,000 on local foods. In 2009, $60,000. Each year since 2012 we have far exceeded $100,000 per annum (over 30% of our purchases). Land, economy, health – inseparable. ♦Joe’s will give you $10. What’s the catch? Well the way we figure it, if you cut out the middleman by NOT using a credit card, we can give that back to you and then some. Credit cards costs the retail merchant about 3-5% and extra time & paperwork. Now let’s be real – in today’s world you can’t function without them. But there are alternatives that reduce our dependency on the Big Banks and actually save all of us money. We have a couple of suggestions: (1.) Joe’s Check List –If you are a “regular” and wish to pay by check, please ask your waiter to get you on the list. (2.) Joe’s gift card– purchase $100 gift card with cash orcheck and get an extra $10 value! ..why is it that doctors call what they do “practice”? ..why don’t sheep shrink when it rains? Treat Mom to a margarita, after all, you’re the reason she drinks. Sign in restaurant: No WiFi. Talk to each other. Get drunk. Follow us on Facebook and Twitter 4.